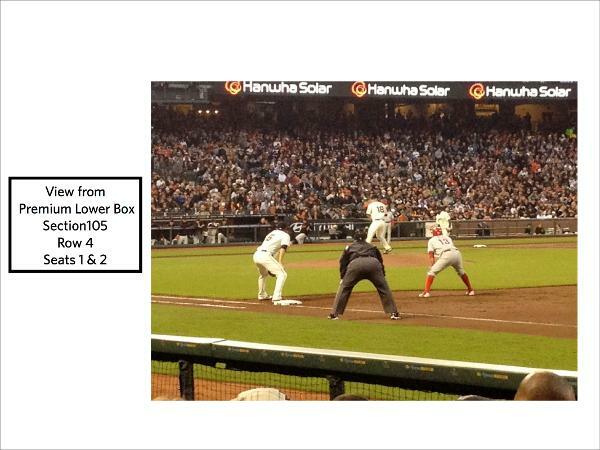 Awesome Seats, 4 rows off first baseline! 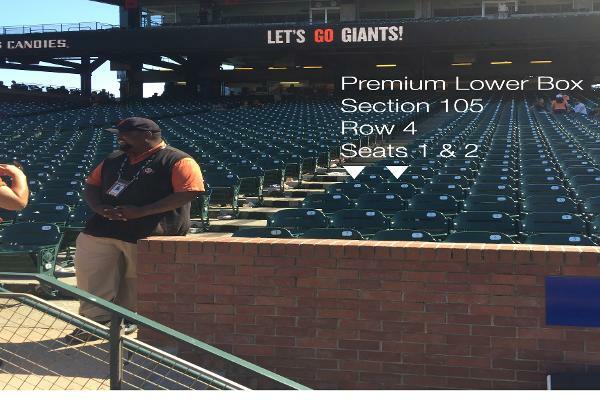 Available for the first time in several years: 20 or 40 game package of awesome Giants tickets. 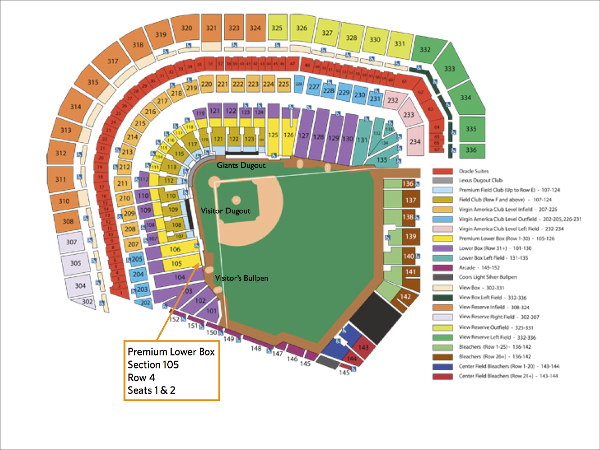 Premium Lower Box (field level), Section 105 (first baseline, visitor's side, halfway up the right field line; Row 4: four rows off the field, and on the aisle. The games do not include the pre-season or Opening Day. Are the Marlins games still available? I'd be interested if so. If you're one of our partners, you'll have your choice of games when it's your turn to select in the ticket draft. I can't guarantee anything, but I'm quite sure you'd be able to select at least one Marlins game. We currently have 5 partners, and are looking for 1-2 more. During day games, are the seats right out in the sun, or is there any shade? For day games, the sun is typically to the left or from behind (as you face the field). By mid to late afternoon, the sun is coming from completely behind the ballpark. I have one more partner confirmed, and now am looking for 1-2 more to join us. Games will be determined via a ticket draft. I've never purchased tickets like this before. What is the proper way to go about this?? We'll be holding a draft for the games, and you'll have your choice of selecting remaining available games as your turn in the draft occurs. This works out for everyone to get a fair distribution of the games over the season. We currently have 4 partners. I will be selecting 20 games, and the other three partners are selecting 10 games. Let me know if you're interested. This listing has been saved by 176 people.